“Jack the Giant Slayer” promises to deliver high action thrills that will leave viewers on the edge of their seats. 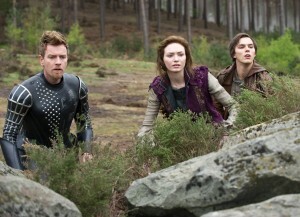 Elmont (Ewan McGregor,) Isabelle (Eleanor Tomlinson,) and Jack (Nicholas Hoult) from “Jack the Giant Slayer.” Photo courtesy of Warner Bros. Pictures. This adventure/drama/fantasy movie stomped out the competition by earning $28 million, soaring to number one in the box office during its opening weekend, according to the IMDb Charts. The modern spin on the fairy tale, Jack and the Beanstalk, gives viewers a refreshing perspective on the story. Bryan Singer, director of “X-Men,” proves to be a master of directing high speed, high impact films again with this classic story-tale. The movie stars Nicholas Hoult as the unexpected hero Jack and Eleanor Tomlinson as the independent Isabelle. Ewan McGregor as a brave knight, Elmont and Bill Nighy as a fearsome giant, General Fallon, rounds out the cast. A strong point of this movie is the talented cast in which they all fit their roles perfectly. The movie opens with young Jack reading a book about giants in his bedroom at night. Young Isabelle listens to the same story in her own bedroom as her mother reads a book to her. The film flashes forward to when Jack and Isabelle are fully grown, struggling to fit in with their families. Jack and Isabelle meet in a series of unexpected circumstances where the mutual attraction between them is obvious to the audience. Writers Darren Lemke, Christopher McQuarrie and Dan Studney found just the right times to insert some humorous moments, especially when characters banter back and forth. Jack is a likeable underdog with talents that are overlooked by other characters. More specifically Elmont who struggles against the odds, making him highly relatable to the audience. The original music, written by John Ottman, emphasizes the high speed action sequences and captures the tender moments between Jack and Isabelle. Film editors Bob Ducsay and John Ottman seamlessly cut between scenes with the right pace to help propel the story along. The movie is at its strongest during the action sequences, including the battles between the humans and the giants, because the special effects are so realistic that it transports the audience into the film. 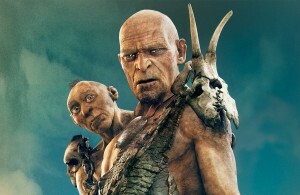 The giants, all created by special effects in post-production, are realistic looking, each with a distinct look and personality. General Fallon (on the right) and his brother (on the left) from “Jack the Giant Slayer.” Photo courtesy of Warner Bros. Pictures. Even the pupils of their eyes contract when the giants are angry. A mystical land complete with a row of gigantic, sculpted statues that look like giants’ heads and waterfalls will leave the audience in awe. Dazzling special effects makes this movie a thrill to watch in both 2D and 3D. A clever scene that closes the film has a few surprises in store, which the audience may not expect. Get your ticket stubs ready and go see the newly vamped “Jack the Giant Slayer,” because this movie is worth the price of admission. This movie’s dazzling special effects will make you feel transported into a fantasy world complete with kings, knights and giants. Go watch “Jack the Giant Slayer” and join Jack on an epic quest!